In 1977 Thom Thi Bach left Vietnam in a boat. She fled her country with 10 children, one of whom was only 12 months old. After four days and nights in a boat, the family landed in Malaysia where they spent seven long months in a refugee camp. At the camp, U.S. Catholic Charities found her and helped her come to the United States in 1978. Her husband could not get out of Vietnam; he died there several years later. In Saigon she had been a professional egg roll maker, a skill she was taught by her mother. As she searched for a way to support her family in Memphis, she seized upon those homemade Vietnamese egg rolls and proceeded to turn them out in her kitchen. The Health Department twice declared the egg rolls illegal, however, on technical grounds. Thom Bach, still struggling to comprehend English, sat through hearings on her right to make egg rolls and said to a reporter at one point: “I ask you where you get license for Vietnamese egg rolls, but nobody can tell me.” Finally, Health officials ruled that she could make her egg rolls in any commercial kitchen, but not at home, and she began to make them in local restaurants. 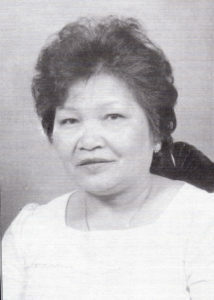 In 1982 she opened the Indochina Care at 2146 Young Street, specializing in Vietnamese food, including the egg rolls. She operates the restaurant with the help of her children — the older ones waiting tables and doing homework between orders, and younger ones playing on the floor behind the counter. Necessity — to flee Communism and to seek a better future — made her family into “boat people. Initiative — the determination to make a good life — made her a Memphis businesswoman, restaurant owner and, above all else, an independent woman.